When I was a child, one of my favorite things to read–besides the Hardy Boys series–was Choose-Your-Own-Adventure novels. Mostly, now, I remember their covers, with their white backgrounds, colorful graphics, and red highlights, as well as the note included in the front of every one of them I can remember: that the books weren’t meant to be read like regular books. If you don’t remember the novels, or if you’ve never seen them, basically, each had a particular premise–pirates, or a mysterious island, or a haunted house, or . . . whatever, really. There were aliens and space travel and underwater adventures and treasure hunting. And each book started out with you–because the books were written in the rare second-person perspective–getting acquainted with the set-up and the setting. After a few pages, you’d encounter your first choice. Sometimes there were two or even three choices for each particular decision, and each one would ask you to flip to a certain page of the book to continue with the story. The main difference between the Choose Your Own Adventure series and the Time Machine series was that Time Machine books featured only one ending, forcing the reader to try many different choices until they discovered it. Also, the series taught children basic history about many diverse subjects, from dinosaurs to World War II. Only the sixth book in the series, The Rings of Saturn, departed from actual history; it is set in the future, and features educational content about the solar system. Some books gave the reader their choice from a small list of equipment at the beginning, and this choice would affect events later in the book (e.g. “If you brought the pen knife, turn to page 52, if not turn to page 45.”). Another main difference between the Time Machine novels and the Choose Your Own Adventure counterparts was hints offered at certain junctures, where the reader was advised to look at hints at the back of the book. An example was in Mission to World War II about the Warsaw Ghetto uprising, where the reader was given the choice of starting the mission in the Jewish ghetto or the Aryan part of Warsaw, in which the hint read “Hitler may have had Jewish family members”, suggesting the reader should begin in the Jewish section of the city, but not ordering it, or it was possible for the hint to be missed. I think maybe that’s why I remember that particular book as more advanced, but it’s also worth pointing out just how much things can influence you without your awareness. Meets Girl may be semi-autobiographical, but The Prodigal Hour is who I am. When I first made Entrekin available on Kindle, one of the early reviews lamented the lack of a working TOC. To be candid, I hadn’t been aware there was a way to make an ebook navigable, but I picked up a formatting book and figured out how to do so. And in doing so, I realized that there were some really interesting possibilities. When you can code a particular word or sentence to be clickable so that it jumps to another part of the book, it creates a suddenly more dynamic storytelling environment. The possibilities, I realized, were endless. Which may well have been part of the problem. I had a lot of ideas, but they were so big, and I’d never done it before, and I realized early on that if I didn’t try another way, I was going to slip right down the rabbit hole. But then I got an idea . . . When I went to USC, during my very first semester, I wrote a story for a class with Rachel Resnick. Now, I grew up reading–and trying to write–novels. I rarely had time for short stories, and so given an assignment that a chapter of my novel wouldn’t exactly fulfill, I had to come up with something new, and I did: I’d been working on a longer work (and still am) and writing about Edgar Allan Poe’s relationship to Charles Dickens, and I suddenly wondered: what if Dickens hired a private detective to investigate the mysterious circumstances of the death of his colleague? It seemed like a neat idea, and then I had the one that made the story for me: what if Dickens hired C. Auguste Dupin, the very first detective in all of literature whom Poe had written about in such classic mystery stories as “The Murders in the Rue Morgue” and “The Purloined Letter.” It seemed like such a fun idea, and I had fun writing it. In getting feedback on the story, Rachel had more to say, and pushed me harder. I remember she mentioned my somewhat cerebral, analytical nature, and she recommended writing something darker, something that wasn’t so winking and playful. So I gave it a try, and in the end, I had two entirely separate stories that both appeared in my collection. “Raven Noir” is more playful and winking and action-oriented, and between Dupin and Dickens it’s always felt, to me, a little like a buddy story. “Addicted to Praise,” on the other hand, removes Dickens entirely, and it’s darker, with a far different tone. I think both are neat stories. I’ve always thought of them as two sides of the same coin, as well as thought they were extraordinarily demonstrative of the different paths any story can take based solely on a few choices. Writers have to make choices in telling a story, and I liked how they demonstrated the executions of one writer making some very different choices, and how the same story can change so vastly. When I realized I was about to fall down the rabbit hole, and though it might be best to try something more simple, I thought of those two stories. I’d always thought I could say something akin to, “So here’s a story about this, and here’s that story told this way, while here it’s told a different way, and you can choose which story you want to read,” but I realized, suddenly, I could take that choice to an entirely new level. 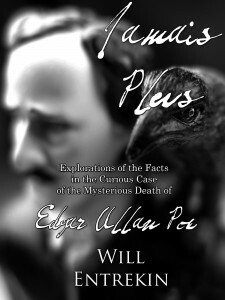 I’d like to introduce you to Jamais Plus: Explorations of the Curious Case of the Mysterious Death of Edgar Allan Poe. To this day, circumstances of the final days of Poe remain mysterious, and this year, this October 7th, this 162nd anniversary of the great writer’s death, I thought it only fitting to not only re-explore those stories but to tell them in a new way, taking advantage of technology and means I didn’t have access to back then. Jamais Plus is a short book, but rest assured, it’s not just the same two stories you’ve already read. It’s a new take on the story told in a new way. It’s not available on any format besides Kindle for now, but that’s because part of the execution of the format relies on the Kindle platform. Like those books from my childhood, it’s not meant to be read linearly; it’s meant to be explored, and its very telling relies on the choices you make during key moments of the story. Assume the role of C. Auguste Dupin–the investigator of Edgar Allan Poe’s classic mysteries “The Murders in the Rue Morgue,” “The Mystery of Marie Roget,” and “The Purloined Letter”–as you attempt to solve the curious case of the mysterious death of Poe himself. Read as Charles Dickens hires once-famous, now-faded Parisian investigator C. August Dupin as the two travel to Baltimore, tracking leads and talking to anyone who might know anything about the mysterious death of Edgar Allan Poe. Will you decide to make the choices yourself, or will you follow as Dickens and Dupin do the heavy story lifting? The choices are yours, and that makes the story yours, too. And it’s yours for just 99 cents.